I just think these are lovely. Lovely looking, creamy, blossomy, with echoes of the courgette itself. 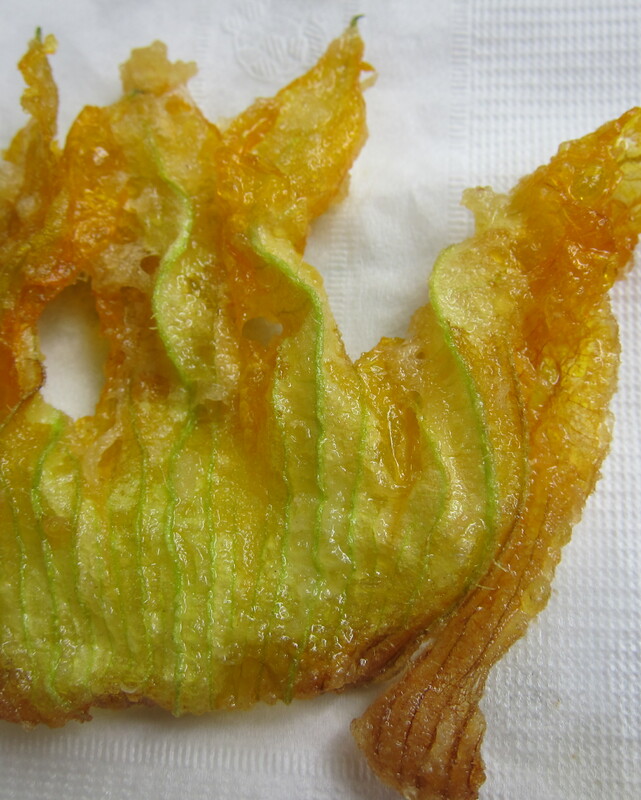 A welter of these, piled high on a plate, having been plunged and fried in batter is the way. And eaten alone. That’s how I remember them when I lived in Rome as a student. This was the early nineties and even my pajamas had shoulder pads. Everyone had a cleavage and shoals of men followed me (and every other young girl in the area) home, loitered and then dispersed to find other prey. 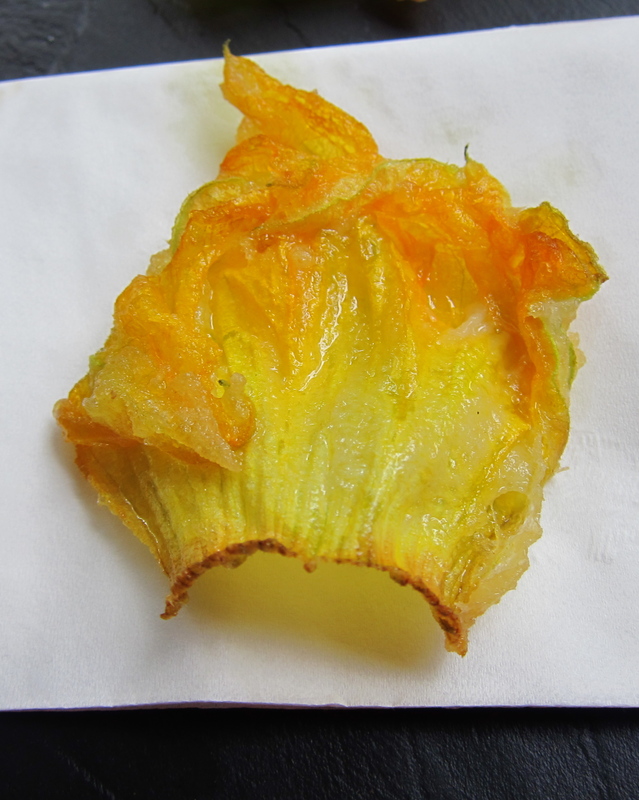 I remember these blossoms in their crispy casings were handy at parties – you could walk around with one, and a napkin would quickly blot up any lingering grease. Either that or it could double as lip gloss. Everyone of my age in Italy lived at home and remained there in their childhood bedrooms doted on by housekeepers until they found someone to marry. No one left home to go to university, except I was at the university of Rome and needed a place to stay, so I lived in the garden flat of an Italian family in Parioli, a swish, hilly enclave. The flat was actually a garage with a bed in it and a small toilet. I remember a window but not much light entered the place and I often woke up at midday or even later, muddled and confused and late for class. I taught English as a foreign language on the side, but this was tricky if still asleep. The dampness and general humidity both in the flat and in Rome in deep summer gave me what is known commonly as il colpo della strega (translated as ‘the witch’s blow’), a lower back paralysis eased almost immediately by plunging into a hot bath. I remember stepping over Marcello Mastroianni who was sitting on my doorstep, having a break from filming, and thinking that I should probably stop and say something, but I was more concerned about getting to the bakery in time to get my bread rolls. Mantovani rolls were thinly crusty on the outside with a warm belly of bread beneath; they were sweet and soft, and I would often walk along eating them bare from their paper bag – they needed absolutely no accompaniment. The same applies to these battered blossoms. Eat them bare, preferably walking, and find a skyline or seascape to stare at, or even a wall, and feel their grassy tentacles dissolve on your tongue. Actually, some soft airy bread might work alongside: ungreased and ripped open with savage fingers. Though these flowers look fragile and papery, they are in fact rich, and a few can make you feel quite woozy. The idea of the batter, known in Italian as la pastella, is to do justice to the delicacy and brightness of the flavour, and so the cleanest, plainest sort is required. I used only flour and water, and a pinch of salt. If you want an upgrade, you could follow Patience Gray’s instruction in Honey from a Weed, and add an egg yolk, a tablespoon of grappa and just enough water to the flour to make ‘not too liquid a batter’. The egg white is also incorporated just before making the plunge. I have never got to this recipe, because I have found the original batter to be exactly as it should be. You could use elderflowers instead of the courgette blossoms. Put 250ml (scant ½ pint) of water in a bowl and sift 80g (2¾ oz) of plain flour over it, beating all the while. By the end, the batter will have the consistency of double/heavy cream. 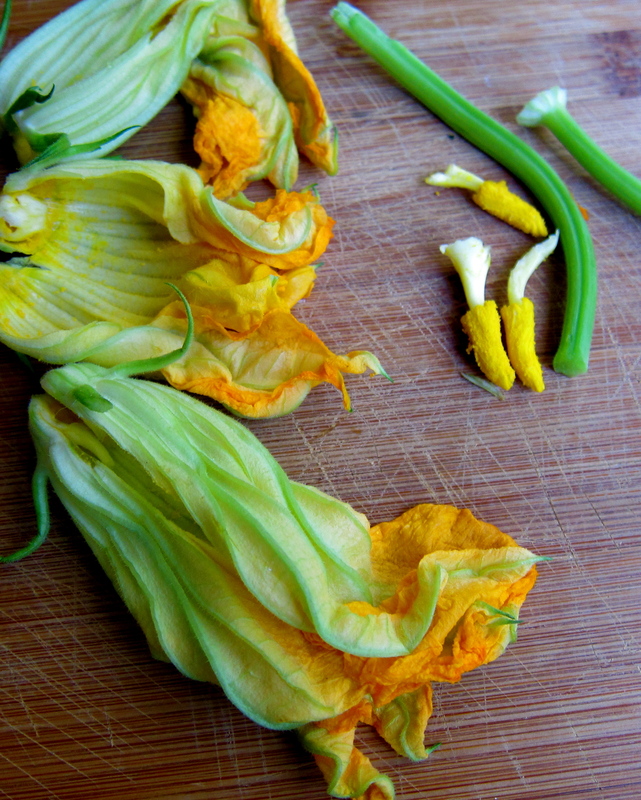 Leave to rest while you get on with the courgette blossoms. Wash the blossoms quickly and tenderly under cold running water and dry them gently on kitchen paper (this is not essential if you know where they’ve been). Snip off the stem and the little hook-like leaves at the base of the blossom. Slit the blossom open on one side (imagine you’re reading a book) without dividing it. Remove the little orange bulb within, otherwise known as the pistil. Heat the oil over a high heat. When it is very hot (drip the minutest drop of batter into the hot oil and see it shrivel up instantly to gauge readiness) dip the blossoms quickly in and out of the batter and slip them into the frying pan. It is important to get the blossoms as open and as flat as possible, otherwise clumps of uncooked batter get secreted in the grooves. When they are golden brown on one side flip them over to cook on the other side. Transfer to kitchen paper to drain, sprinkle with sea salt and eat quickly, while still hot and crispy. Truc uses them, stuffed with ground shrimp and pork, coated in batter and fried! However they come. they are delicious!! Thank you. Interesting and quite involving recipe, by the sounds of it. Thanks. Though born and raised in the U.S. my Italian heritage is never more evident than when savouring this delicacy. Shhhhh. Don’t tell anyone else lest there be fewer for us to indulge! 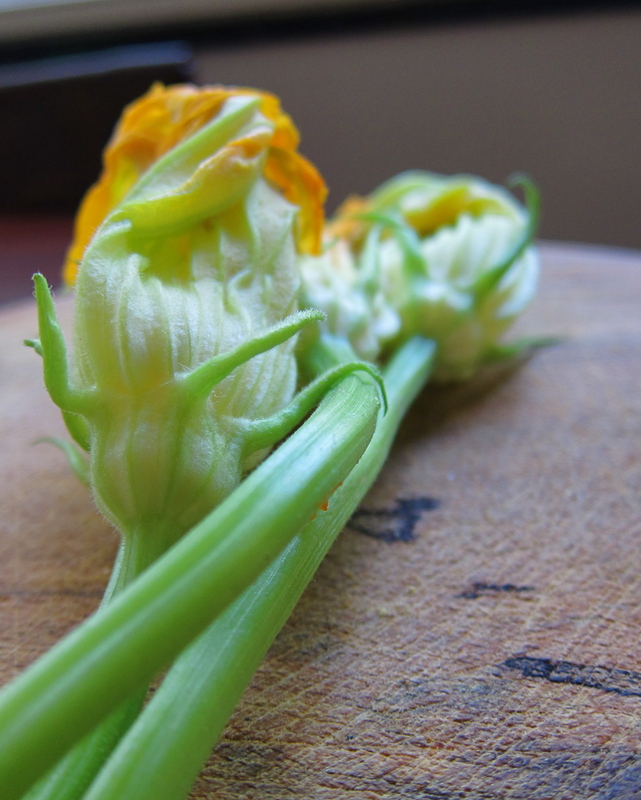 I am growing Zucchini Florence Romanesco this Spring specifically for the male flowers….can’t wait to try this! Mouthwatering description! These look so beautiful – but I am absolutely dying to get a taste of the rolls you described! Just have to try this! I have a courgette in a large pot on my patio and am hovering over it waiting for the next flower to appear. What a great story. Shoulder pads and cleavage… ha! Marcello on your doorstep?! Did you know who he was? I’ve always wanted to try these…. (as documented on my blog) I’ve had something of a problem with my temperamental courgette plant, so this year it was not to be. Will persevere! Next year will be The Year!